Kingston to NY State and Back! Though some may say I’m crazy, I recently embarked on my first international (I can say international since we crossed into New York State!) 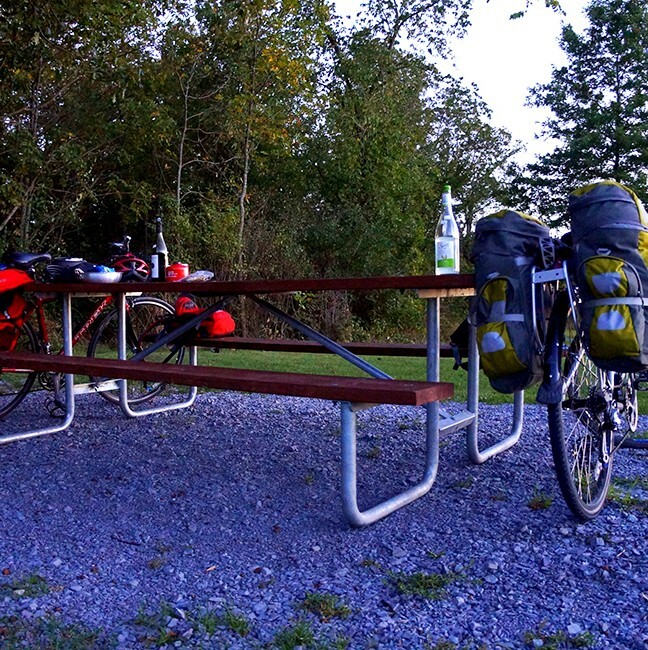 multi-day cycling tour. 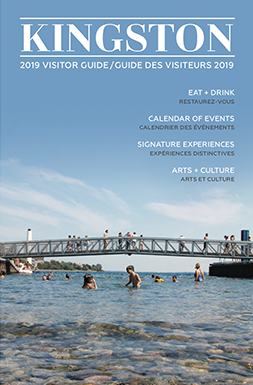 Our chosen route was to leave Kingston from downtown, head to Gananoque and cross into New York State via the Thousand Islands Bridge, camp on Wellesley Island, cycle along Lake Ontario and come back into Kingston via the Wolfe Islander Ferry. We mapped out our ride using MapMyRide to see the elevation change and to check for route recommendations. While road cyclists finish this 120 km route in 8 hours I can proudly say we finished within our self-imposed 48 hour time limit! Though we were successful and returned home unscathed (for the most part) we certainly learned some lessons along the way. Both being notoriously slow in the morning, my cycling pal Kathy and I left Kingston around 10 am and made our way to Gananoque for our first pit-stop. I rode a hybrid bike (a mix between a mountain and a road bike), a Kona Dew, and Kathy chose a road bike as her trusty steed – a Trek Pilot. Along with the required bells and lights we had both outfitted our bikes with mirrors, racks and pannier bags (aka. Saddle bags) that were stuffed to the brim with camping gear. We outfitted ourselves with bike helmets (of course!) and reflective running clothes – we decided we didn’t need any fancy cycling gear (spoiler alert: we were wrong!). We decided to take the scenic route to Gananoque via Howe Island which involved a ferry on both ends which were free for cyclists. The roads on Howe Island were nice and quiet – perfectly suited for cycling. 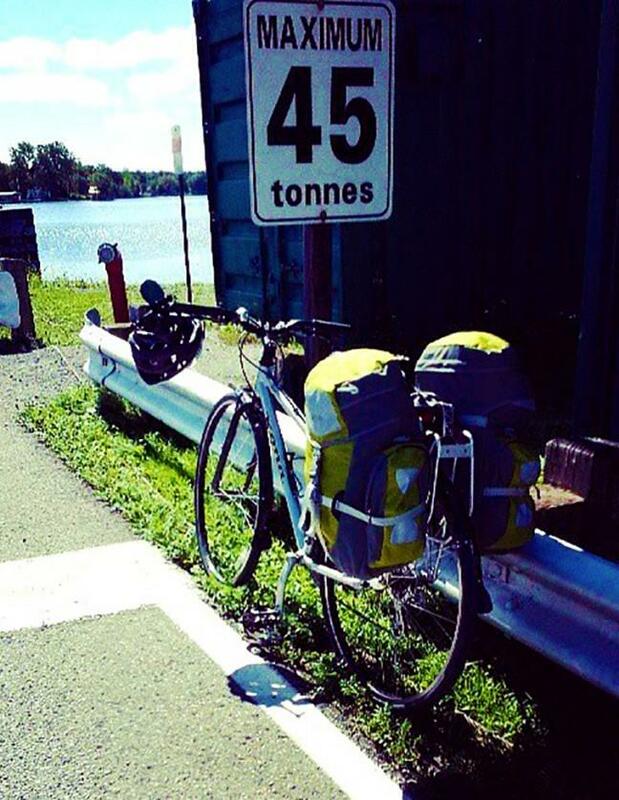 Boarding the Howe Island ferry near Kingston Ontario – does my bike loaded with camping gear fall within the 45 tonne limit? By the time we pedalled into Gananoque a couple hours after leaving Kingston, the Socialist Pig was beckoning our names. We stopped in for a well-deserved lunch knowing we still had a few more hours of cycling before we reached our campsite for the night. A few other groups of cyclists had the same idea as there were a multitude of fancy road bikes lining the patio. None of the spandex-sporting cyclists we talked to were energetic (or crazy) enough to do an overnight tour though – most of them were heading back to Kingston after lunch. After leaving the Pig behind we cycled on the paved off-street path along the Thousand Islands Parkway – it was great not to have to worry about traffic from Gananoque to Ivy Lea. Soon we were crossing over the Thousand Islands Bridge which is free to cross for cyclists. As soon as we started on our way we saw another group coming our way. Since the pedestrian walkway is so skinny we quickly turned back and let them pass. We learned our first lesson – the Thousand Islands Bridge is single file! 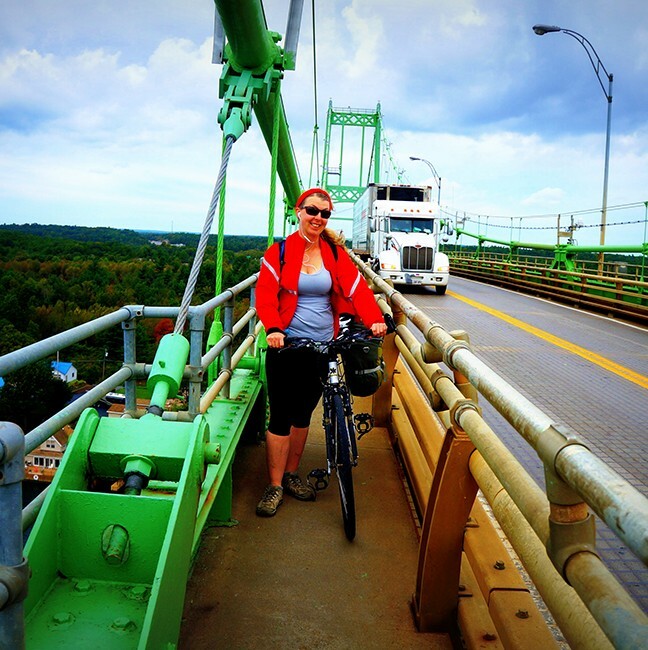 Crossing the bridge from Wellesley Island – luckily I didn’t have to ride with traffic! After the first bridge we made it to the Duty Free store. After meticulously choosing our selections we got to the cashier who asked us for our licence plate number. We proudly stated that we didn’t have one since we were travelling self-supported… by bicycle! Then we learned our next lesson – you cannot buy Duty Free without a licence plate number and, therefore, a car. We regretfully left our potential purchases and crossed into the States for the first time ever on two wheels. Now the sun was starting to set and we picked up our pace to get to the Wellesley Island State Park. Wellesley Island didn’t give our legs a break as the same Canadian Shield terrain that formed the Thousand Islands was present on Wellesley. As we were rounding the last turn before the campground we found a corner store with a wide selection of refreshments – hurray! We stocked up on beverages for the night before hurrying off to the campground. After a good night’s sleep we packed everything into our pannier bags and headed for the Wolfe Island Ferry at Cape Vincent. I learned my next lesson that morning – padded cycling shorts are definitely worth it! Day two was a lot less leisurely and my knees started to hurt towards the end and my hands started to go numb. Kathy on her professionally-fitted road bike was much better off. My next lesson: get a professional bike-fitting to prevent injuries. 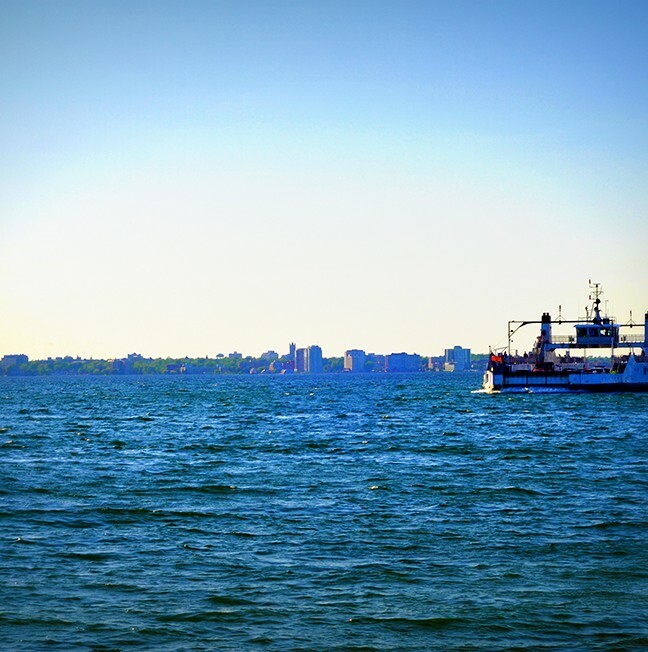 After a long, and sometimes painful day of cycling we were very happy to see the Kingston skyline as we rode the Wolfe Islander home. Kingston also has a multitude of shorter routes that I try out when I’m looking for a quicker ride. Biking out to Lemoine Point from downtown is a nice route with huge shoulders. I also love doing the loops north of Kingston; going north means more hills but the terrain is beautiful. If you’re nervous about traffic the K&P trail is a good off-street option. The Gears and Grinds website has a lot of suggestions for fitness loops to try. Google Maps also has a cycling route option that gives reasonable time estimations for a recreational cycling pace and even features bike trails. The City of Kingston Cycling page also has useful information about the rules of the road and links to cycling clubs. Be sure to familiarize yourself with how to ride in traffic on the MTO Cycling site before venturing onto the street. 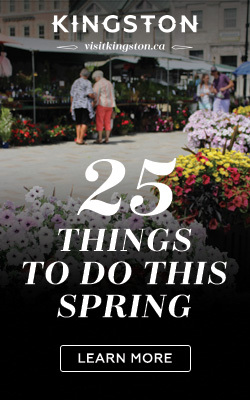 If you’re looking to dust off a bike in your garage, or need to pick up a new one, there are a number of friendly local bike shops in Kingston to make sure your old bike is safe or your new bike fits you. Aaron at Gears and Grinds specializes in road bikes and hybrids (G&G is where I got my Kona Dew). Aaron also organizes a lot of group rides – he’s a great resource for different routes to try around town. Graham at Frontenac Cycle has a wide selection and brands to choose from and keeps a lot of bikes in stock for you to take for a test ride. The staff at Ted’s Road & Tri can also help you choose a bike to suit your needs and partner with Cyclepath next door. I can’t wait for my next cycle tour, but rest-assured I will be investing in cycling shorts and a professional bike fitting!